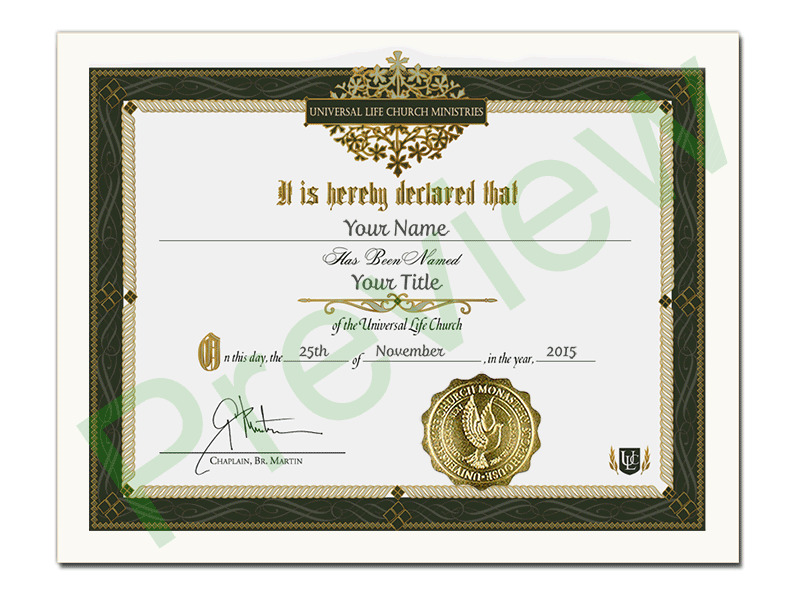 These Religious Title Certificate feature your name and chosen title, hand written by the founder of the Calligraphy Society on high quality paper. You must be ordained and logged-in before adding this to your cart. Which title do you want showing on the credential? Though the ULC does not have a hierarchical structure, we now offer titles of position and authority for independent churches and personal ministries. After placing your order, you will receive a certificate with this title awarded to you by the ULC. These titles are perfect for hanging and framing. Any titles in the name field will be removed (examples: reverend, pastor, P.H.D., M.D., minister). Degrees will be shipped alone at a later date since they need 2 weeks to be create. The date that goes on the degree is the order date, not the ordination date. International orders will be held until the degree arrives, then we will ship it out. FedEx shipping option is not available for this degree, it will be shipped alone at a later date. To find more information regarding shipping and returns, please click HERE. The wedding is happening in New York, but outside of NYC. If this wedding is being performed in Nevada, there are a few more steps to make it legal.